^ Scott Pelland; Kent Miller; Terry Munson; Paul Shinoda (October 1996). "Epic Center". Nintendo Power. M. Arakawa, Nintendo of America, Inc. (89): 60. ^ a b c d e f Thomas, Lucas (September 2, 2008). "Super Mario RPG: Legend of the Seven Stars Review". IGN. Retrieved January 7, 2010. ^ Ogasawara, Nob (April 1996). "Super Mario RPG". GamePro. No. 91. IDG. p. 47. ^ Smithy: "Hurrumph! Better yet... Why don't YOU give me YOUR stars. Why, then I could easily conquer this world! Then we could get rid of all wishes, and create a world filled with...WEAPONS!!" Square (1996). Super Mario RPG. Super Nintendo Entertainment System. Square. ^ Square (1996). Super Mario RPG: Legend of the Seven Stars. Super Nintendo Entertainment System. Nintendo. Mallow: Oh, no! That REPTILE stole my Grandpa's coin! / My Grandpa asked me to buy some things for him here. When I walked into town, that croc stopped me! Oh yeah! He took it from me! He stole my coin! I chased him, but he's way too fast... / I'm Mallow from Tadpole Pond. I'm a frog, but can you believe it? I can't jump. Embarrassing huh? ^ Square (1996). Super Mario RPG: Legend of the Seven Stars. Super Nintendo Entertainment System. Nintendo. Mack: Listen up, gang! These guys are gonna put a stop to OUR party! Are we happy about this?! ^ Square (1996). Super Mario RPG: Legend of the Seven Stars. Super Nintendo Entertainment System. Nintendo. Geno: But Mario and I must leave now to find... the missing Star Pieces... / Gaz: Star Pieces? You mean like shooting stars? What for? / Geno: No one's wishes will come true until the Star Pieces are found and the Star Road repaired. Which is why I have chosen to join these two in order to find the missing Star Pieces. ^ Square (1996). Super Mario RPG: Legend of the Seven Stars. Super Nintendo Entertainment System. Nintendo. Booster: I'm Booster and this is my famous tower of amusement. Normally I welcome visitors to play with me and my Snifits. However, a girl fell out of the sky and into my lap, recently. Since then, I've been busy keeping her happy and entertained. I no longer have the time to play. So please enjoy yourself... at your own risk, that is! / My bride-to-be is chanting, "MARIOHELPMEMARIOHELPME". Is she showing her happiness? ^ Square (1996). Super Mario RPG: Legend of the Seven Stars. Super Nintendo Entertainment System. Nintendo. Toadstool: Finally...let's get back. / I'm finally home! / We need to go and find those Star Pieces, NOW! / Chancellor: Princess! You CAN'T be serious! You're NOT thinking of joining them, ARE YOU? This is sheer madness... You're a Princess! What will people say?! / Toadstool: I don't care! Things seem so hopeless right now... / Mario! Please, Mario! Take me along with you, please! / So...let's go find us a star! Hmmm... But I wonder where it could be... I have absolutely no idea! Do you? / Okay then! Let's do it! ^ Square (1996). Super Mario RPG: Legend of the Seven Stars. Super Nintendo Entertainment System. Nintendo. Queen Nimbus: The last star... Wait! The only place left to look is in Bowser's Keep! ^ Square (1996). Super Mario RPG: Legend of the Seven Stars. Super Nintendo Entertainment System. Nintendo. Clerk: Production is on schedule? This, despite the fact that Mack, Bowyer, Yaridovich, and the Axem Rangers were defeated. At this rate, Smithy will have a new army in no time! ^ Square (1996). Super Mario RPG: Legend of the Seven Stars. Super Nintendo Entertainment System. Nintendo. Smithy: NOOOOOOOOOOOO...!!! / Guooooooo!!!!! My b...body and head are burning! It's not...possible...! I don't believe it...! I'm...finished...done for...! Guooooooooo...noooooo...! / Geno: Come on, Mario! Send the last one way up high!... Thank you, everyone! The Star Road is back to normal! ^ a b "Nintendo Ultra 64: The Launch of the Decade?". Maximum: The Video Game Magazine. Emap International Limited (2): 107–8. November 1995. ^ "Future Fantasies". GamePro. No. 87. IDG. December 1995. pp. 136–9. ^ Scott Pelland; Kent Miller; Terry Munson; Paul Shinoda (April 1996). "Epic Center". Nintendo Power. Nintendo (83): 56. ^ Scott Pelland; Kent Miller; Terry Munson; Paul Shinoda (October 1995). "Special Features". Nintendo Power. Nintendo (77): 29. ^ a b c d Scott Pelland; Kent Miller; Terry Munson; Paul Shinoda (October 1995). "Mario plays a new role". Nintendo Power. M. Arakawa, Nintendo of America, Inc. (77): 26–29. ^ Scott Pelland (November 1995). "Epic News". Nintendo Power (77): 51. ^ a b c Scott Pelland (December 1995). "Epic News". Nintendo Power (77): 51. ^ Scott Pelland (November 1995). "Release Forecast". Nintendo Power (77): 113. ^ Scott Pelland (December 1995). "Release Forecast". Nintendo Power (77): 113. ^ "Games - ZSNES Documentation". ZSNES. Retrieved March 24, 2013. "IGN Top 100 Games 2008". IGN. Archived from the original on November 10, 2008. Retrieved September 8, 2011. ^ Shimomura, Yoko (October 1, 2009). "Interview with Yoko Shimomura (September 2009)". Square Enix Music Online, GameMusic.pl. Retrieved August 9, 2011. ^ Thomas, Damian (March 23, 2001). "Super Mario RPG OSV". RPGFan. Retrieved August 9, 2011. ^ GameFAQs (CNET Networks) (March 23, 2006). "GameFAQs—Fall 2005: 10-Year Anniversary Contest—The 10 Best Games Ever". Video Game Cheats—Video Game Reviews—Video Game Codes—Video Game Web Site—GameFAQs. CNET Networks, Inc. p. 1. Archived from the original on July 16, 2015. Retrieved February 20, 2007. ^ "IGN Readers' Choice 2006 - The Top 100 Games Ever". Video Game Cheats—Video Game Reviews—Video Game Codes—Video Game Web Site—GameFAQs. IGN. October 5, 2006. p. 1. Retrieved February 20, 2007. ^ The Magic Box (The Webmaster) (October 31, 2006). "The Magic Box: Platinum Game Chart, Japanese Console Games Sold Over One Million". The Magic Box: International Videogame News. The Magic Box. p. 1. Archived from the original on December 13, 2007. Retrieved February 20, 2007. ^ Staff (June 20, 1996). "US RPG Demand Surprises Nintendo". Next Generation. Archived from the original on June 6, 1997. ^ Staff (August 24, 1996). "Mario RPG Tops Rentals Again". Next Generation. Archived from the original on April 19, 1997. ^ "Super Mario RPG: Legend of the Seven Stars Reviews". GameRankings. Retrieved September 10, 2007. ^ a b "Super Mario RPG Review from SNES, Wii from 1UP.com". 1UP.com. Ziff Davis. Archived from the original on April 24, 2015. Retrieved April 24, 2015. ^ a b c Miller, Skyler. 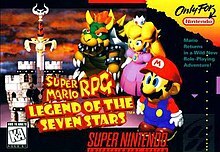 "Super Mario RPG: Legend of the Seven Stars - Review - allgame". AllGame. Archived from the original on December 11, 2014. Retrieved April 24, 2015. ^ a b c Baran, Andrew; Lefebvre, Mark; Desmond, Mike; Sushi X (July 1, 1996). "Super Mario RPG: Legend of the Seven Stars (EGM 82)". Electronic Gaming Monthly. Archived from the original on May 14, 2004. Retrieved April 24, 2015. ^ "Mario RPG Review". Retrieved May 22, 2010. ^ a b c "Plumbing Depth". Next Generation. No. 18. Imagine Media. June 1996. p. 126. ^ a b c Derek 'Roku' Cavin (March 13, 2004). "Mario Gets HP". RPGamer. Archived from the original on September 30, 2007. Retrieved February 21, 2008. ^ Dan Owsen & Scott Pelland (March 1997). "1996 Nintendo Power Award Nominations". Nintendo Power (94): 76, 77, 79–82. ^ Scott Pelland (May 1997). "1996 Nintendo Power Awards Winners". Nintendo Power (96): 88, 89, 92, 93. ^ a b "Super Mario RPG: Legend of the Seven Stars". GamePro. No. 92. IDG. May 1996. pp. 84–85. ^ "Super Mario RPG: Legend of the Seven Stars Reviews". 1UP.com. May 9, 2004. Archived from the original on October 20, 2012. Retrieved August 7, 2011. ^ "The Best of '96". Electronic Gaming Monthly. No. 92. Ziff Davis. March 1997. pp. 86, 88. ^ Kennedy, Sam (August 28, 1999). "First Impressions: Super Mario RPG 2". GameSpot. Retrieved September 4, 2007. ^ Ahmed, Shahed (May 19, 2000). "Super Mario RPG 2 Japanese Release Date". GameSpot. Retrieved September 4, 2007. ^ AlphaDream (November 17, 2003). Mario & Luigi: Superstar Saga. Game Boy Advance. Nintendo. Level/area: Little Fungitown / game credits. ^ West, Tracey (2006). Mario and the Incredible Rescue. Scholastic Corporation. ISBN 0-439-84366-9. ^ Nintendo Japan (May 30, 2008). "Japanese Virtual Console list - June 2008". Virtual Console Reviews - Nintendo Japan. Retrieved May 30, 2008. ^ Anderson, Luke (August 26, 2008). "Super Mario RPG hits Europe VC". GameSpot. Retrieved June 28, 2017. ^ Vuckovic, Daniel (August 21, 2008). "Hanabi Festival returns - Super Mario RPG arrives in Australia". Vooks. Retrieved June 28, 2017. ^ White, Billy (August 22, 2008). "Hanabi Festival brings Super Mario RPG to Europe". Wiiloveit.com. Retrieved June 28, 2017. ^ "SMRPG arrives on the Wii Virtual Console for sale at 800 points". IGN. September 1, 2008. Retrieved December 9, 2008. ^ "『スーパーマリオRPG』と『ダウンタウン熱血物語』がWii Uバーチャルコンソールで8月5日配信開始". Famitsu (in Japanese). July 29, 2015. Retrieved June 28, 2017. ^ Skipper, Ben (December 21, 2015). "Super Mario RPG heading to Nintendo Wii U virtual console on Christmas Eve". International Business Times. IBT Media. Retrieved December 21, 2015. ^ Wassenaar, Troy (December 23, 2015). "Aussie Nintendo Download Updates (24/12) - Holiday Special - eShop News from Vooks". Vooks. Retrieved June 28, 2017. ^ Dornbush, Jonathon (June 29, 2016). "Super Mario RPG Releasing for Wii U Virtual Console This Week". IGN. Retrieved June 28, 2017.